A radiator with a fan heats the room quicker and improves efficiency . Our kitchen/living area was often the coldest room. With our pattern of use, it’s good to be able to warm it up quickly. The fanned radiator described here blows warm air out into the room, past where we sit, which feels good, heating up the whole room much quicker than before. It does this even when our gas boiler flow temperature (of water it sends to the radiators) is set below 60°C. Condensing boilers are more efficient at lower water temperatures – a subject for another post? Do you want more, quick heating from a radiator? Is your radiator cool because it needs bleeding or is blocked by sludge? Or is it badly obstructed by furniture or curtains? Add a commercial add-on radiator fan to boost your radiator’s heat output. Radfan is the leading brand and gets good reviews. 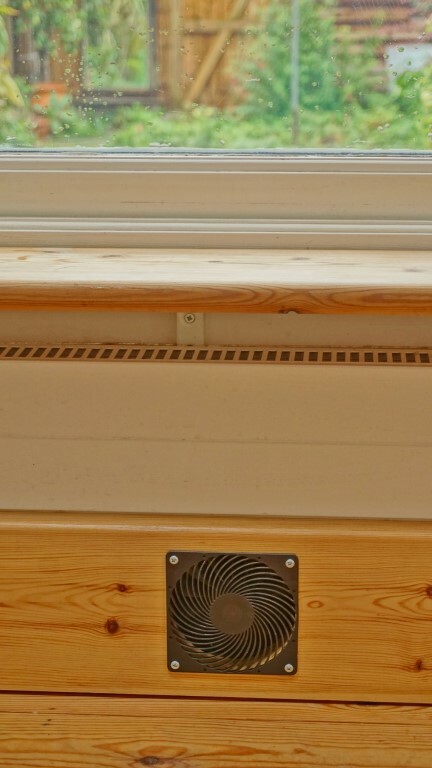 By increasing the airflow past the radiator’s panels and fins, more heat is extracted from the central heating water into warm air and is pushed out into the room. 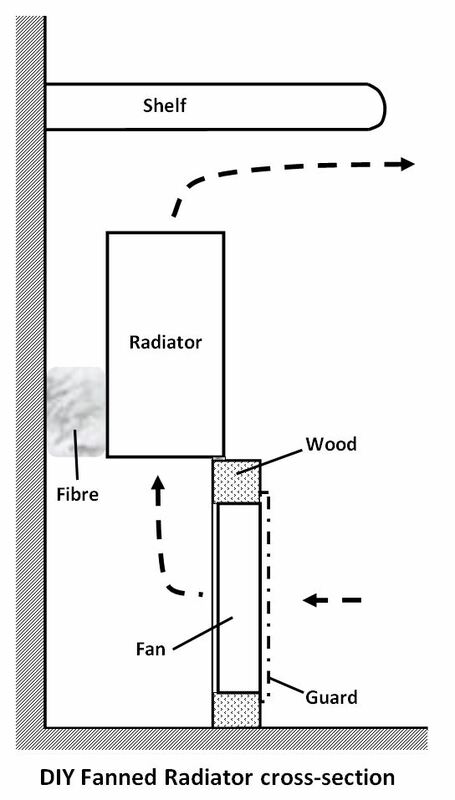 Or construct a DIY fanned radiator, as described below. It should do a similar job to a Radfan at lower cost and with better results because it’s customised to your radiator and needs. Radfans and the DIY design below both use 12V fans, powered by a plug-in power-supply, so they are mains-safe and suitable for home installation or construction. The fans consume just a few Watts and only switch on when the radiator is hot, so their electricity consumption is minimal. All the fans make a little background noise – we don’t find it a problem, but everyone’s different! I added fans to a radiator with an unusual shape: it’s 2m long and low to fit under a long window with a wide shelf/window seat. You can adapt these ideas to suit your situation. Because of the length, I chose to fit 3 fans, but 2 would probably have been enough. The fans were fitted into a piece of wood that closes the gap between the front of the radiator and the floor. Plywood cheeks at each end complete the seal, with foam draught-proofing strip closing any gaps, so that all the fanned air blows through the radiator. Air blown by the fans would rush between the back of the radiator and the wall, which I blocked with recycled-plastic insulation (easy to handle), but any way of blocking this space is good. The rear of the radiator would normally also warm air, convecting heat into the room, but I think it’ probably better to focus the airflow through the middle of this radiator, where it has a lot of fins. A shelf over the radiator is good anyway to direct warm air into the room, rather than up the wall. In this design, it really helps create the airflow shown, which feels good when you’re sitting nearby! The front of the fans are protected with guards to keep children’s fingers out! I looked for quiet, efficient 120mm 12V DC computer fans, choosing 3 x Aerocool Airforce from Overclockers at £6.95 each. The other relevant specs were 25.4dB(A) noise, 52.65 cfm airflow for 1.44W consumption each. The plug-top 12V power supply (PSU) needs to be capable of supplying the total fan current consumption. A modern one should have <0.3W quiescent consumption when the thermostat is off. Even this can be avoided by switching off at the mains outside your central heating season. 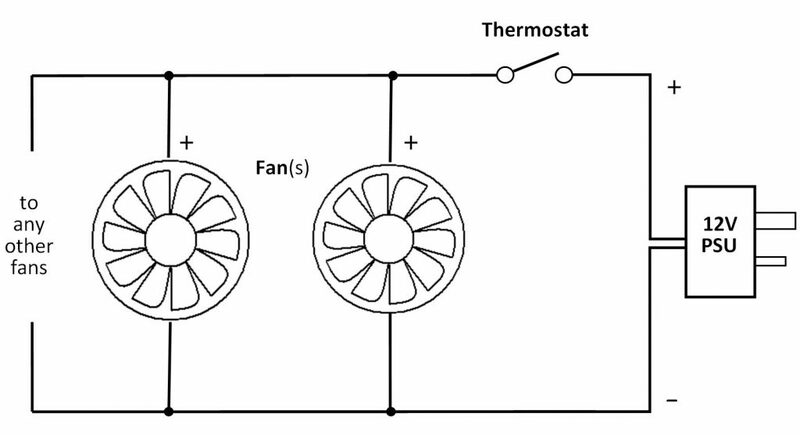 The normally-open bimetallic disc thermostat has a nominal 30°C switching temperature, so it comes on when the radiator’s warm. It’s glued to the radiator where it doesn’t show. Depending on the lengths, the connecting wire needs to be fairly low resistance. I used speaker cable. It’s been reliable. The only maintenance has been cleaning the fan blades and guards annually, as they tend to accumulate dust, which can cut airflow & increase noise. Hoping you too can enjoy the benefits! This fanned radiator is on show at the Eltisley Avenue Open Eco Home.